The ensemble Hamburger Ratsmusik has had a long and close association with Johann Philipp Krieger. After all, his operas were performed by the original group during the composer’s lifetime at the Oper am Gänsemarkt in Hamburg. 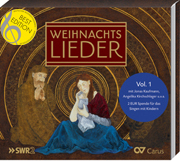 Over a decade ago, the ensemble revived Krieger’s cantatas from the Bokemeyer Collection, performed them at Schloss Gottorf, and recorded them on CD. This exploratory work led to creative collaborations and friendships, as with the Krieger scholar Dr. Klaus-Jürgen Gundlach. 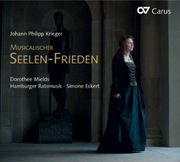 The performance of the Musicalischer Seelen- Frieden in the place for which it was written, the Weissenfels Schlosskirche, was one of the highlights in this regard. However, the greatest surprise came from another Herr Krieger, who spoke to the Hamburger Ratsmusik musicians after a concert in Altdorf in Franconia, and then showed them his ancestors’ charter of nobility from Emperor Leopold. 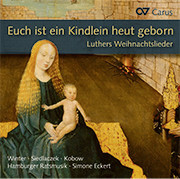 This CD, which the ensemble recorded with Doro thee Mields, forms part of this living tradition. 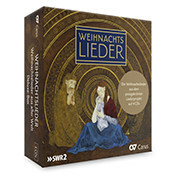 In recording these concert her indescribable and committed singing, always guaranteed a thrilling experience. 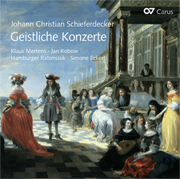 After 21 years of working together as an ensemble, 25 CDs – almost all world premiere recordings – numerous concerts, two Echo-Klassik awards and a growing enthusiasm for the music of the Renaissance, Baroque, and classical periods, Hamburger Ratsmusik is looking forward to more discoveries and projects.